Growing up in south Louisiana, off-roading was kind of my heritage. I remember mud riding behind the levee on the banks of the Mississippi River and using recently plowed sugarcane fields as a whoop section because we were trying to emulate or motocross heroes. In Monster Energy Supercross 2 you can fulfill your childhood dream of becoming a Supercross champion. Monster Energy Supercross 2 allows you to play as one of 40 professional Supercross riders. You can also create your own rider to play, although once you start career mode you’ll be forced to do this. Italian developer Milestone takes its second swing at bringing the popular AMA Motocross Championship to the PS4 and with new features and subtle tweaks. The two leagues of Supercross (250cc and 450cc) are here with the 250cc league being broken down into east and west leagues. What this means is that tracks are broken down by whether you’d like to race on the east or west coast with some middle America tracks thrown in for good measure. 450cc has you racing all nineteen tracks. Anaheim appears twice in different track configurations. Career mode is broken up into weeks, where you’ll have either two or three days to schedule activities before the big race. Two out of the four activities are essentially mini-games. Promotional and media days are a bore. They feel very bare bones compared to the training and challenges activities and are non-interactive cutscenes watching your character pose in-front of his bike. 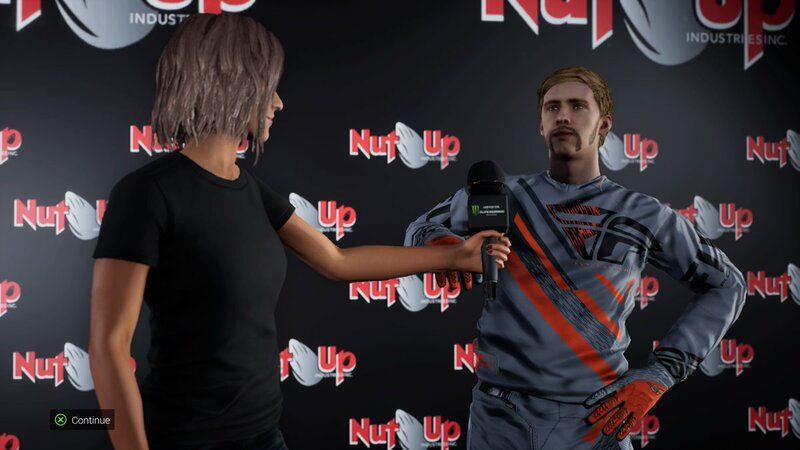 Compare this to other career modes such as in NBA 2K and Madden where you can take questions from journalists and your answers effect how the fans or your team thinks of you, and Monster Energy Supercross 2’s seems lacking. The last two actives are training and challenges. Training allows you the choice to focus on one of a few racing stats including landing, reaction speed, and cornering. The cornering training has you weaving in and out of corners trying to hit a specific speed. Doing this will net you one to three stars. The more stars you receive the more points you get and completing multiple training sessions unlocks the next difficulty. Challenges are a head-to-head battle with an AI racer of your choosing. This is where the Rivalry feature comes into play. As you complete races on the circuit the rivalry percentage for each racer will go up. For racers 50% or below, it’s a head to head battle on the track. If the racer’s rivalry stat is above 50% then it’s a time trial giving you a lap time to beat. You get three laps to beat the timer. If you are faster on any lap, you win. Winning these challenges nets you experience and reduces that racer’s rivalry percentage. After you complete your weekly obligations it’s time to race. This is truly where the game shines and Milestone has clearly put in a lot of work. The pre-race ceremonies feel authentic—if not a bit robotic compared to the professional broadcast. Announcers herald your arrival into the arena without saying any specific dialogue about the racers. A poorly rendered woman holding up a sign with the number 30 appears before the racers. Twenty one riders are at the gate ready to compete. The stadiums are beautiful rendered and upon entering a race it can be day or night with clear skies or a rainy muddy mess. Unfortunately, I didn’t find that the rain messed with my handling at all. I still took corners the same as I did during a clear sunshiny day. The controls are very easy for new players, but will take you a couple races to understand how the bike handles. Milestone has worked a lot on improving the racing from the first game. Rhythm is a big factor in Supercross races and like other racing games Monster Energy Supercross 2 now has a racing line called rhythm which shows you how to take jumps to keep your speed. For expert players the rhythm line can be turned off pre-race. The tutorial for the game isn’t very much help and I suggest just launching into the compound mode and getting a feel for it. Speaking of the compound this is my favorite bit about the game. A big open area that has a mix of jumps, obstacles, and terrain you will find during races. Practicing my skills here to take them to the big race was the way I approached improving at the game. You start with just one compound and you are able to unlock more as you play. Single races, time trials, tasks and challenges are all the ways to unlock new customization options for your compound. The compound feels like it would be a great place to hang out with other players while waiting for an online match. Watching people do tricks in an open environment would help hide the frequent and long load times that are a plague with Monster Energy Supercross 2. Lastly, there are online races and the features here aren’t very deep. You can join a quick match or create a room. Most noteworthy, the total amount of racers in an online match is 12 riders, down from 22 in career mode. There isn’t a lobby system and matchmaking doesn’t exist so you will be racing against players of all skill levels. Once a race is complete players will vote on tracks and weather conditions for the next race. Joining a race with a host who doesn’t have a great internet connection will cause the race to have a ton of lag. Other issues I encountered during online races were player positions being incorrect on the post race standing and players disconnecting if they don’t get a great start. Currently players are not punished if they leave a multiplayer race. Above all the two biggest issue that can’t be overlooked are the horrendous loading times and the currency grinding you’ll do. During my 250cc east career I spent more time loading than I did racing. The weekly activities are short and you load to enter and exit them. Doing research on the first Monster Energy Supercross game this was a huge concern from the community that Milestone didn’t address. I’d like to see the load time issues addressed by the compound being used as a lobby. Put me in an area where I can just mess around while the game loads instead of putting down the controller and walking out of the room. Consequently, the currency grind to upgrade your bike and customize your rider is what ruins this game for me. Every item purchased in the game is 30,000 credits or higher. I wasn’t able to unlock any upgrades for my bike during my first season in career mode. This left me wondering why I was in the mode at all if I didn’t feel any sense of progression. A couple of bugs occurred during my time with MES2. The music skipped frequently during loading screens, and the noise that plays when you earn credits once decided to play indefinitely. This continued in every part of the game including races which forced me to shut the game down and restart it. Monster Energy Supercross 2 review code provided by publisher. Version 1.02 reviewed on a PS4 Pro. For more information on scoring please see our Review Policy here.